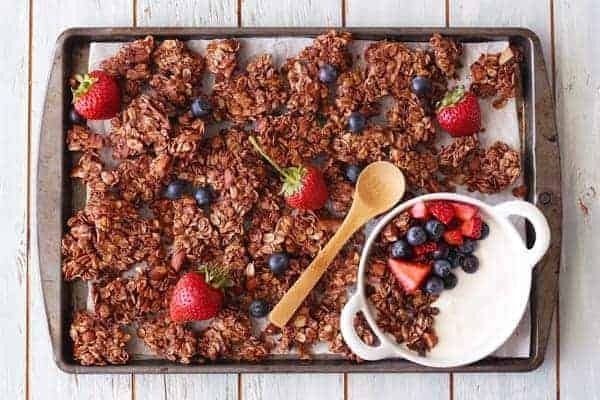 An irresistible combination of chocolate, coconut, and almonds, this small batch chocolate granola tastes great on its own but is even better with fresh or freeze-dried berries and Greek yogurt. 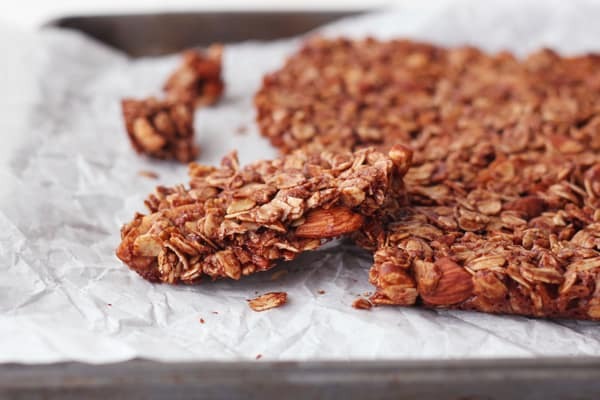 The hardest part of this toaster oven recipe is waiting an hour for it cool so you can get the biggest, chunky, chocolatey granola clumps. Waiting is tough (especially when your house smells amazing) but is so worth it! Homemade granola is the BEST! It’s simple to throw together and easy to customize for your tastes. While this rich and indulgent granola is pretty free-form, the recipe does have one important RULE YOU MUST follow: Mix the oil and cocoa powder together first. If you don’t your granola will be dry and powdery. Been there. Done that. It doesn’t taste good. Instead, whisk the oil and cocoa powder together into a rich chocolate syrup. 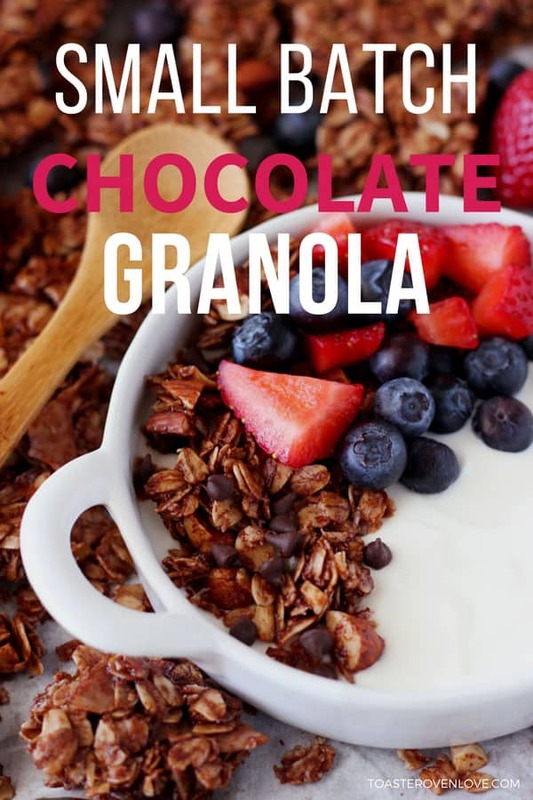 Then add the rest of the ingredients and you’ll be on your way to enjoying a small batch of chocolate granola that tastes way better than store-bought and is less expensive too! Satisfy your chocolate cravings small-batch style with this easy granola recipe! 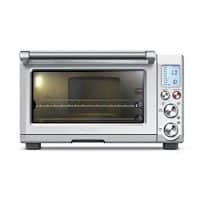 Adjust the toaster oven baking rack to the lowest placement and preheat to 300°F and lightly oil an 11 x 7-inch baking pan or line a quarter sheet pan with a silicone baking mat. In a large bowl combine the oats, coconut flakes, and almonds. In a small bowl whisk together the coconut oil and cocoa powder until all of the cocoa powder has dissolved into the oil. Whisk in vanilla, brown rice syrup, brown sugar, and salt until fully combined. Pour chocolate mixture over oats mixture and stir well to coat everything. Dump the mixture into the prepared pan. Compress the granola with a spatula or heavy measuring cup into an even compact layer. Bake granola until it is almost dry to the touch and the coconut flakes are a light golden color, about 20 minutes. 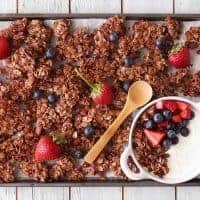 Remove granola and cool in pan for at least 1 hour. 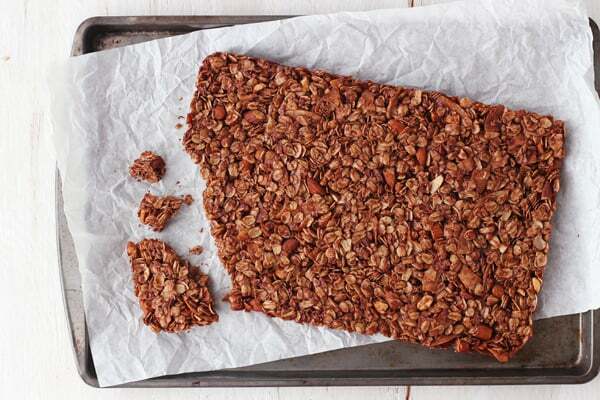 Turn cooled granola onto a cutting board or piece of parchment and break into clusters. Store granola in a well-sealed glass jar at room temperature for 7 to 10 days. Cook times includes one hour of inactive cooling time. The recipe makes about 12 ounces or 3 cups of granola. Recipe adapted from our Maple Pecan Toaster Oven Granola recipe which is adapted from America's Test Kitchen Cooking for Two Cookbook. Adjust the toaster oven baking rack to the lowest placement and preheat to 300°F. Initially, I tried baking this recipe at 325°F like our other toaster oven granola recipes. But I found the granola burned around the edges. At 300°F, the granola got toasty without burning. 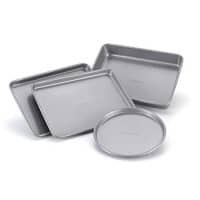 Now, line your baking pan with a toaster oven silicone baking mat or lightly oil the bottom and sides. If I’m making this in our little toaster oven I use a 7 x 11-inch baking pan. If I’m using our larger Breville Smart Oven Pro I usually grab a quarter sheet pan. Next make your granola by combining the oats, coconut flakes and almonds in a large bowl. 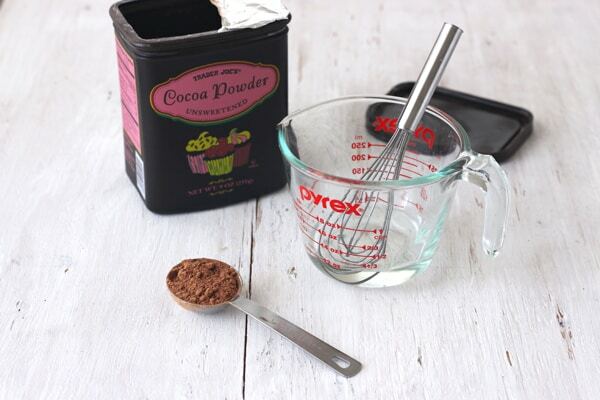 In a small bowl whisk together the coconut oil and cocoa powder. Once ALL of the cocoa powder has dissolved into the oil whisk in the vanilla, brown rice syrup, brown sugar, and salt until fully combined. We tried a bunch of different types of sugar (maple syrup, honey, agave, etc.) 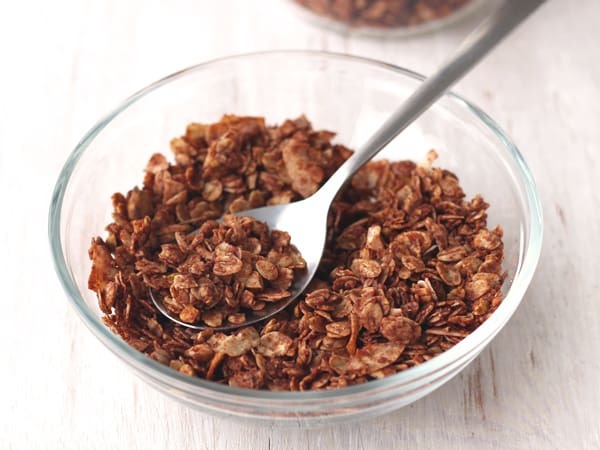 and shared how they changed our granola on this post for Maple Pecan Toaster Oven Granola. Pour the chocolate mixture over the oats mixture. Take a minute and use a rubber spatula to stir the granola really well. You want to make sure all of the oats, coconut and almonds are coated with the wet ingredients. Next, dump the granola into your prepared pan. For super chunky granola – Use the back of a rubber spatula or a heavy measuring cup to compress the granola into an even compact layer. Then, don’t stir the granola while baking. Craving some light and flaky granola? That’s cool too. To make flaky granola, don’t compress the wet ingredients. Instead, stir it after 10 minutes of baking and then every 5 minutes until crisp. Using either method, bake the granola until it is almost dry to the touch and the coconut flakes are a light golden color, about 20 to 22 minutes. 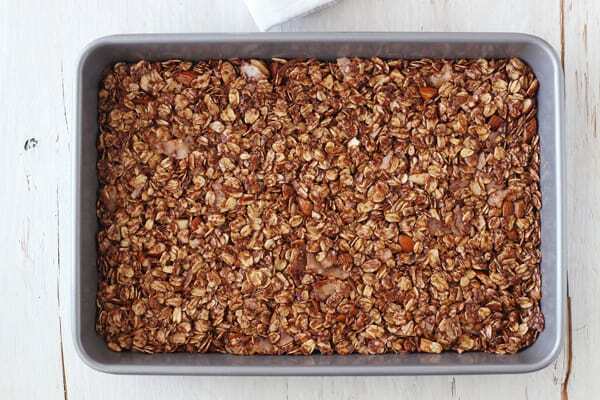 Remove the granola from the toaster oven and let it cool for at least at least an hour. 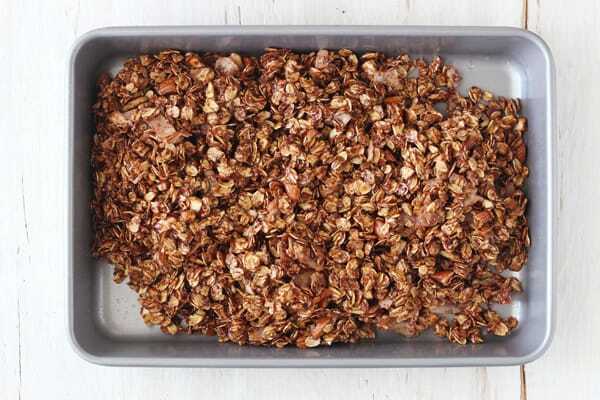 *Until I got comfortable and figured out the best time and temperature for making this granola in our toaster ovens I had some difficulty telling when it was done baking. I mean it’s hard to see browning on an already brown item. If you’re having trouble too, underbake the granola by a few minutes. Then turn off the toaster oven and leave the pan inside to cool for about 10 minutes or so. To break up the super chunky granola, I like to lay down a piece of parchment paper and turn the cooled granola out onto it. It’s usually a big single piece, especially if you used brown rice syrup! Then you can break it into clusters and clumps and use the parchment paper to help transfer the granola to jars for storing. i make granola all the time but ive never made a chocolate version–delicious!